stands heads above the former and only slightly behind the latter. So, what’s stopping you from making a rough puff for your next tart? Possibly the perception that it is difficult, but I promise you it is not. I contemplated including the recipe for rough puff pastry in this post, but when you can have pastry master Michel Roux in your home teaching you, how could I possibly top that? Michel Roux’s you tube video for Rough Puff pastry became a major topic of conversation in our household while I was making it as I love his accent and the way he says “rough puff pastry”. It’s the way I imagine the count on sesame street would say it. I imitated it so much that Scotty actually gave me a limit to the number of times I was allowed to say it while making the pastry. This maple roasted pumpkin caramelised onion and goats cheese tart was my contribution for a picnic in the park with friends a few weeks back. The rough puff, maple roasted pumpkin and caramelised onion were prepared in advance and then all put together and baked that morning – the perfect picnic tart. I love the rustic-ness of a free-form tart as it means there are no special tart cases required to pull off something spectacular. I’ve taken to finding excuses to roast things with maple syrup, and pumpkin is the perfect candidate! coupled with caramelised onion, goats cheese, sage, and flaky buttery puff crust this tart is packed full of flavour and oh so satisfying. Place pumpkin cubes in one layer on a lined baking tray and pour over maple syrup and olive oil. Season with salt & pepper, then toss pumpkin to coat and bake for 20 minutes until tender. Heat oil in a large heavy frypan over low heat. Add the onions and salt and cook for 18-20 minutes, stirring occasionally, over low heat. Once the onions have softened and are golden, add the brown sugar and balsamis and continue to cook over low hear for 5-10 minutes till sticky and caramelised. Don’t be tempted to increase heat to save on time, you will just burn the onions and they will not caramelise. Roll out the rough puff pastry till you have a circle about 40cm in diameter. Transfer the pastry to baking paper and leaving a 5-6cm gap around the edges, top evenly with the caramelised onion. Then top with the maple pumpkin, crumble over the goats cheese and add a few sage leaves on top. Fold the pastry border up and over the mixture, pleating as necessary. Brush the pastry with a mixture of the egg white and milk and then transfer the tart and baking paper to a baking tray and bake for about 40-50 minutes until the pastry is golden. Remove from heat and set aside to cool before serving. Nice one Fee Fee. Will give it a crack myself! Fun video! I’ve made rough puff pastry, and it’s such a time saver. Although more often than not I use commercial puff pastry (it’s not cheap, alas). But I should make my own more often — it’s so good and easy. Great tart, too. I love caramelized onion, and I’ll never turn down goat cheese. ooh! am so trying the pastry! now that the weather is cooling down a bit, its time to whip out the pumpkins! 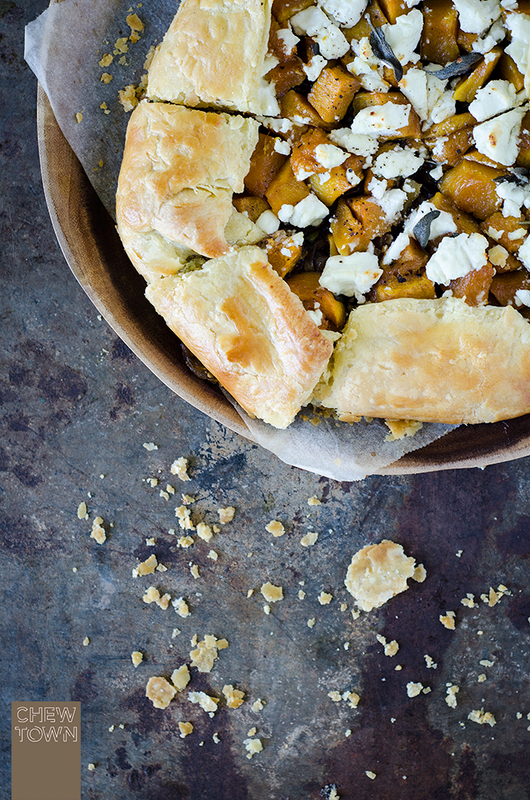 This MAPLE PUMPKIN, CARAMELISED ONION AND GOATS CHEESE FREE-FORM TART seems tasty… Wanna eat all of this. Who needs to find excuses to use maple syrup? Great flavour combo. Omg wow this was divine!! I made this for a work do and everyone couldn’t stop raving about it! Have passed your recipe on! I didn’t have time to make my own pastry as i’m moving houses and I only have Filo pastry. it worked fine and I don’t know how I couldn’t have improved it! I’ve just imagined, how I ask my boyfriend to make me 1/4 cup male syrup… blah 😀 Check the ingredients 🙂 It’s funny. OMG! that’s hilarious… and totally EW!. I’ll head in and update the ingredients now. Definitely not as tasty the other way. Hello, this looks delicious! ;-P Just wondering if it freezes?